Got a question about inflatables? Find the answers in our FAQ. If you can’t find what you’re looking for, please contact us anytime for further assistance. What makes Happy Hop Inflatables so much fun? Imagine being a kid and bouncing high and low and sliding in water in an entire castle to yourself! If that is not fun, we do not know what is! Why should we buy a Happy Hop Inflatables for our child? Happy Hop’s Inflatables are completely safe for children – with our advanced machinery production, combined with our extensive durability testing from over 1,000 employees, you can be sure that your child will be completely safe playing in our Inflatables! They can be set up in minutes – The superior design of Happy Hop’s Inflatables allows them to be set up in minutes, and will last for HOURS of playtime and fun! They are light, portable and easily carried – Happy Hop’s Inflatables can be easily carried by just one person! We have a large range of sizes and features – No matter your budget, the size of your home or your family size, we have a size and feature for every budget, every home, and every family! Our castles are versatile to weather – Some of our castles have detachable roofs, allowing your kids to bounce in the sun or in the shade! We have water-slide models for hot days – On hot days, the first thing that comes to mind is water. But who needs a pool or the beach when you have Inflatables with a giant water slide? Happy Hop’s water slide Inflatables are guaranteed to give your children the slide of their lives! 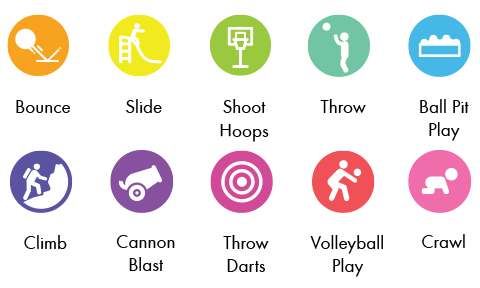 Day-After-Day of fun and exercise – You are not only investing in a clearly superior product, you are investing in daily fun and exercise for your children! Is it worth spending this much of money just for fun? Exercise – Your child will want to spend HOURS playing on Happy Hop’s Inflatables – which means HOURS of physical activity and exercise! Motor development skills – Playing on Happy Hop’s Inflatables means your child gets to engage in activities that is going to help their bodies develop stronger and faster than ever! Balance and coordination – Bouncing in Happy Hop’s Inflatables will help children develop body coordination and learn how to balance themselves, which will help your children tremendously when they get older. Strategic thinking – Children will develop thinking skills and learn to strategize as they bounce and manoeuvre through our castles! Expanding their imagination – As your child plays, our castles will spark their imagination! Social and interaction skills – The more children play with each other in our Inflatables, the more they will be developing their social and interaction skills! Creating a safe playing environment – Our castles are completely safe, allowing your child to play without the risk of exposure to hazardous situations. Healthier alternative to watching TV, playing video games, tablets, and other latest gadgets – Children are very prone to video game addiction, which can lead to poor performance in school, lack of social skills, and even health problems. With Happy Hop’s Inflatables, children are kept away from video games and other gadgets, allowing them to develop in positive and healthy ways! 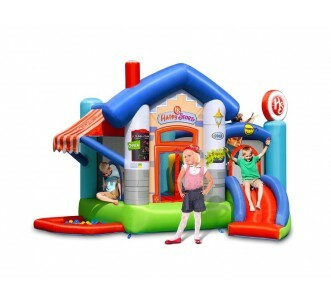 How does Happy Hop’s Inflatables compare to other brands? 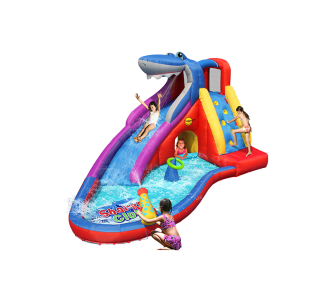 We have a vast selection of inflatables to choose from, including jumping castles, floating trampolines, pool water slides and more. Our inflatables are strictly home grade use. We use only the best 18 oz. vinyl polyester and mesh on all our products. But where bouncing is concerned, we use 20 oz. laminated PVC for the best quality. Our products are the result of years of Research and Development, with features selected specifically to provide the most benefits to your child. We also adhere strictly to stringent safety standards. Our creative and unique production methods create durable Inflatables that are better than any similar product on the market! How much space do we need to set up our Happy Hop Inflatables? We have many designs and sizes that can accommodate your space, the specifications of which are available on our product page. 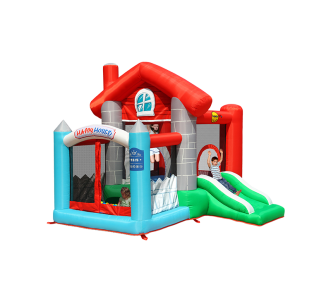 If in doubt, write to us at sales@happyhop.com.my with the measurements of the area you want to place your Happy Hop Inflatables and we will gladly assist you in choosing the perfect Happy Hop Inflatables for your home. How easy is it to set up Happy Hop’s Inflatables? Setting up is super easy! You can inflate it in less than 60 seconds so you can get your party started fast! Plus, it only takes one person to set it up! How portable are the Happy Hop Inflatables? Can be carried by one adult. Can be taken to friends and family’s homes. They can even travel back to your country of origin with you if you’re an expatriate living in Malaysia. Our blowers are also portable as they come with a handle on top, allowing you to carry it anywhere. Does Happy Hop’s Inflatables need constant electricity supply? Yes. Constant electricity supply is necessary for all Happy Hop Inflatables while in use. Where can we set up Happy Hop’s Inflatables? Are Happy Hop’s Inflatables safe? Yes. With over 1,000 employees, each castle is extensively tested for durability and reliability. Our multi-laminated polyester at high-grade PVC construction aligns with strict, world-wide standards. 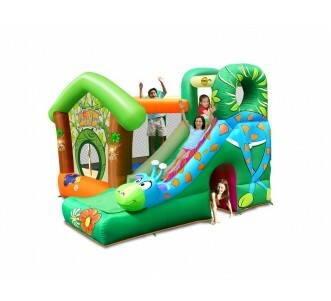 More importantly, Happy Hop Inflatables are built for long lasting fun! Other safety standards included in the 7 Phthalates requirements. We also operate an ISO 9001: 2008 compliance Quality Management system because we take pride in providing quality products at competitive pricing. Are adults able to play with the kids in Happy Hop’s Inflatables? Actually, it is NOT a good idea for adults to play in Happy Hop’s Inflatables. Our Inflatables are designed for kids only. However, thanks to our design, adults can supervise from the outside to ensure children’s safety. What if it rains when Happy Hop is in play? Make sure your children leave the castle if it starts to rain. While our castles can withstand the rain, keep the electric blower from rain and water to prevent damage. Once it stops raining, let your Happy Hop Inflatables fully dry in the sun before letting your kids play again, or deflate it, roll it up and store it in your carry bag. How many kids can play in a Happy Hop Inflatable at one time? What do we do if there is a power outage while our kids are playing on Happy Hop’s Inflatables? 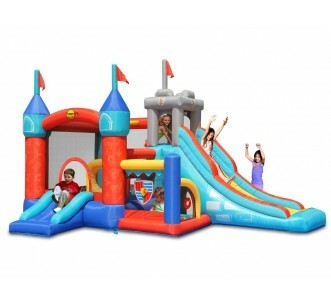 Make sure all kids quickly and calmly exit the castle to ensure their safety. Are we able to rent out our Happy Hop’s Inflatables? Definitely NOT recommended. 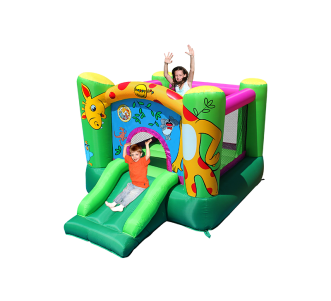 Our Happy Hop Inflatables are not for commercial use and will not be covered by our warranty if rented out for commercial purposes. Can we leave our Happy Hop Inflatables and the electric blower outdoors overnight? Not a good idea. The weather can cause wear and tear damage to your Happy Hop Inflatables and your electric blower. It is best to keep it in your carry bag when you are not using it. How much space do we need to store our Happy Hop Inflatables? Your Happy Hop Inflatable can be easily stored anywhere in your house and takes up a small amount of space. Just roll up your deflated castle into your included carry bag and store it in a safe, convenient place. How do we clean our Happy Hop Inflatables? Happy Hop’s Inflatables are completely washable and easy to clean. Use mild detergent to remove stains and dirt spots. Leave it under the sun to dry completely in order to prevent mildew problems! Does the product price include GST (Goods & Services Tax)? Do you provide cash on delivery (COD) payment options? No, we do not. We provide online banking payments, debit card payments, credit card payments and PayPal payment options. Are there any discounts available for Happy Hop’s Inflatables? When will we receive our Happy Hop Inflatables after we place an order? 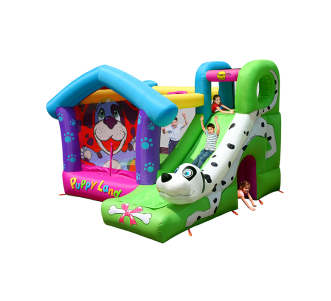 You will receive your Happy Hop Inflatables within 3 to 4 business days for locations within Semenanjung Malaysia and 7 to 8 business days for locations within Sabah And Sarawak. Why is our tracking number invalid? City Link Express has not updated your delivery information on their website. You might have keyed in an incorrect tracking code. Your Happy Hop Inflatables may have been delivered a long time ago and the information has expired. Write to us at sales@happyhop.com.my and we will contact City Link Express for you so you don’t have to. Your questions will be answered within 2 business days. Do we need to pay for delivery? Absolutely not! FREE shipping for you with every Happy Hop Inflatables order! What do we do if we receive a damaged Happy Hop Inflatables? It is rare that our customers receive damaged Happy Hop Inflatables. But if this does happen, send us photos of the damage as soon as possible. We ask our customers to always check their items within 72 hours of their Happy Hop Inflatables’ arrival so we can fix the issue as soon as possible. Not only will we take care of the delivery costs – we will also send you a brand-new replacement Inflatable! We do not practice a refund policy. But if you happen to receive a damaged Happy Hop Inflatables, send us photos of the damage as soon as possible. We ask our customers to always check their items within 72 hours of their Happy Hop Inflatables’ arrival so we can fix the issue as soon as possible. Not only will we take care of the delivery costs – we will also send you a brand-new replacement Inflatable!